As people all across the country flock to Austin, the city has undergone tremendous development, resulting in previously quiet submarkets like The Domain and East Austin expanding and evolving into vibrant business and entertainment communities. While these emerging markets have garnered a lot of attention, the micro-markets surrounding them have also quietly benefited from their neighbors’ transformation. 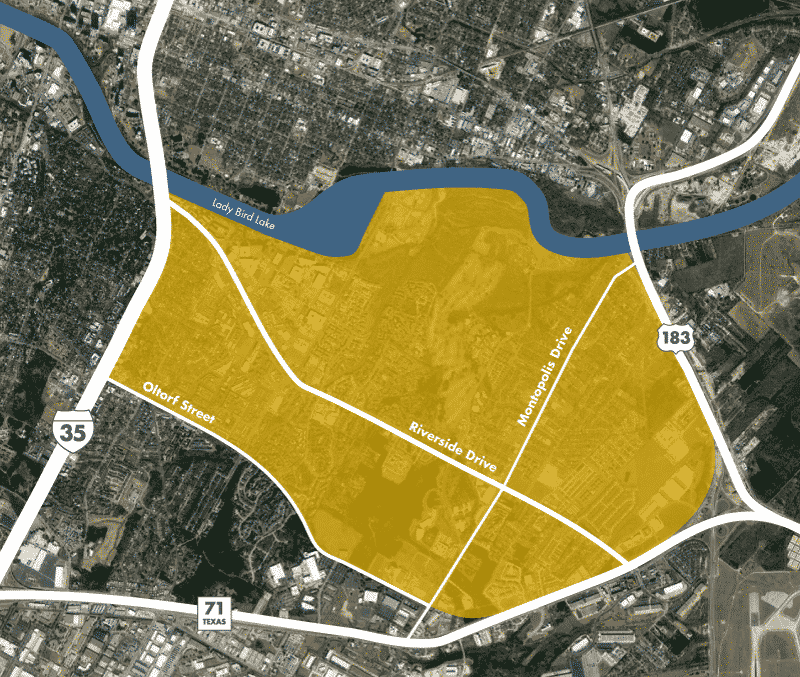 One of these micro-markets, the East Riverside Corridor (ERC), is a previously underdeveloped area just South of Lady Bird Lake that has benefited greatly from the growth of East Austin and its proximity to downtown. The corridor’s location along Riverside Drive provides exceptional visibility on some of the most highly traveled roads in Austin, allowing unparalleled connectivity to all parts of the city. With immediate access to IH-35, SH-71 and US-183, the main corridor is only five minutes from downtown, eight minutes from Austin Bergstrom International Airport and only three minutes from the heart of East Austin. It is also only two miles from the bustling South Congress district, which is rapidly becoming one of the strongest retail destinations in the country due to its walkable mix of eclectic shops, restaurants, bars, food trailers, music venues and galleries. In addition to its proximity to some of Austin’s flourishing commercial centers, the corridor also has some of the city’s best lakefront real estate along Lady Bird Lake. The area is the point of origin for two of Austin’s Capitol View Corridors, giving developments in the area some of the most beautiful, unobstructed downtown views in the city. The East Riverside Corridor has a strong talent pool with many young, educated professionals who like the area due to the low cost of living and proximity to Oracle, downtown and trendy East Austin. 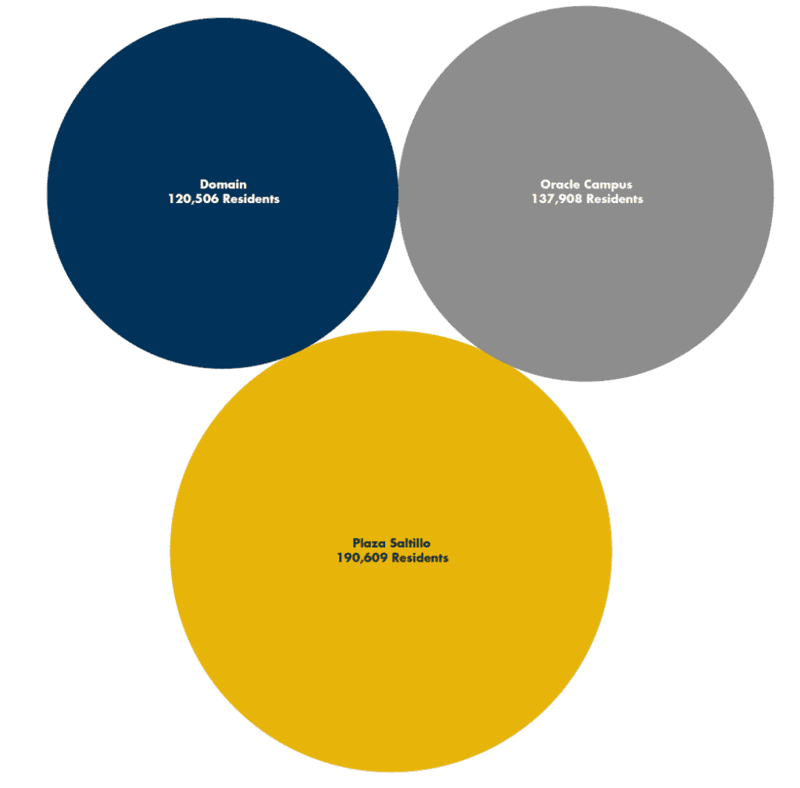 According to ESRI Demographics, a three-mile ring surrounding the Oracle Campus houses a residential population of 137,908, making it slightly less populous than the same size ring surrounding Plaza Saltillo in East Austin (which houses 190,600 residents) but substantially larger than the residential population in and around The Domain (120,506 residents). A surprising statistic is that nearly half of the population located in the 78741 area code (the zip code surrounding the East Riverside Corridor) is millennials (45.6%) ‒ and the next largest generation is even younger, with Generation Z making up 25% of the population. Over 70% of the population is below the age of 30! By comparison, the zip codes encompassing the Plaza Saltillo development and The Domain are composed of only 37% millennials and 32% respectively. In previous years, young professionals flocked to The Domain and East Austin as they got priced out of downtown, bringing great success to mixed-use developments in these areas. As as the cost of living skyrockets in these areas it appears that the younger generations are now migrating to the ERC, making the area a prime location for the large, mixed-use developments that these generations prefer. The ERC has seen a lot of interest from multi-family developers. Since 2010, over 2,000 multifamily units have been delivered in the ERC, and those projects have an impressively low vacancy rate of 8.5%. Additionally, over 1,000 multifamily units are either under construction or proposed to the city. The office market, however, was non-existent until recently. Historically, the Southeast submarket as a whole has seen little in the way of office development. 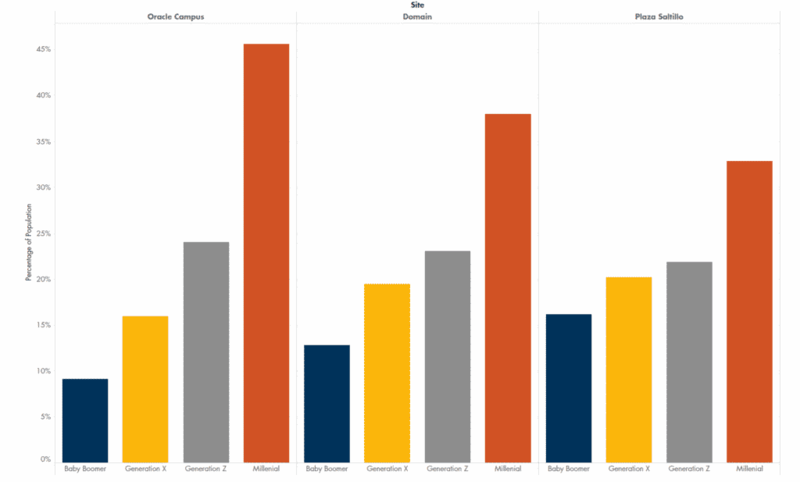 However, following the delivery of Oracle’s 560,000-SF campus in January of 2018, the Southeast submarket saw a 15.9% increase in office product. 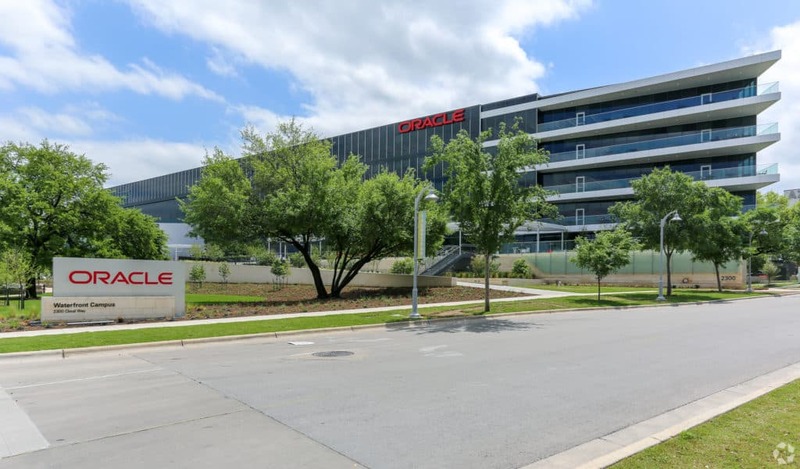 Oracle’s lakefront campus, which sits on 27 acres and is estimated to have cost the global tech giant over $300 million, will support around 3,000 employees as Oracle expands its Austin presence by 50%. The completion of Oracle’s campus has sparked interest from office users and developers, creating an office market where there previously wasn’t one. Project Catalyst is a 97-acre planned mixed-use development at the intersection of East Riverside Drive and Pleasant Valley Road. Very little has been made public about the developer’s plans for the development, but according to permitting and rezoning applications filed through the City of Austin, the completed project will consist of nearly 5,000 apartment units, 600 hotel rooms, 4,000,000 SF of office space and over 400,000 SF of retail space. This ambitious plan will likely take several years to get through the City’s permitting process, and the phased development likely won’t be completed for several decades. Nonetheless, a project of this size deserves to be on everyone’s radar. HFF recently brought Riverside Place to market for sale. The 10.24-acre retail center is currently 98.7% leased and also located near the intersection of East Riverside Drive and Pleasant Valley Road. The center is zoned as East Riverside Corridor Mixed Use, allowing it significant redevelopment potential. So long as the developer meets the affordable housing component, the project will be eligible to receive a development bonus allowing a building height of up to 160 feet with no density restrictions. Until the property changes hands, it is too soon to know what will be built on the site when existing leases in the center expire. However, with the favorable zoning, it is not unrealistic to assume that a developer will build over 1,000,000 SF of mixed-use commercial space consisting of multifamily, office and retail. want this developments map as a pdf? Download this map as a PDF and easily save or share. Downtown and East Austin are the usual areas Austinites identify as they contemplate the immense change their city has undergone. However, there is a newcomer in the sea of change that has the potential to quickly appear at the forefront of the market. 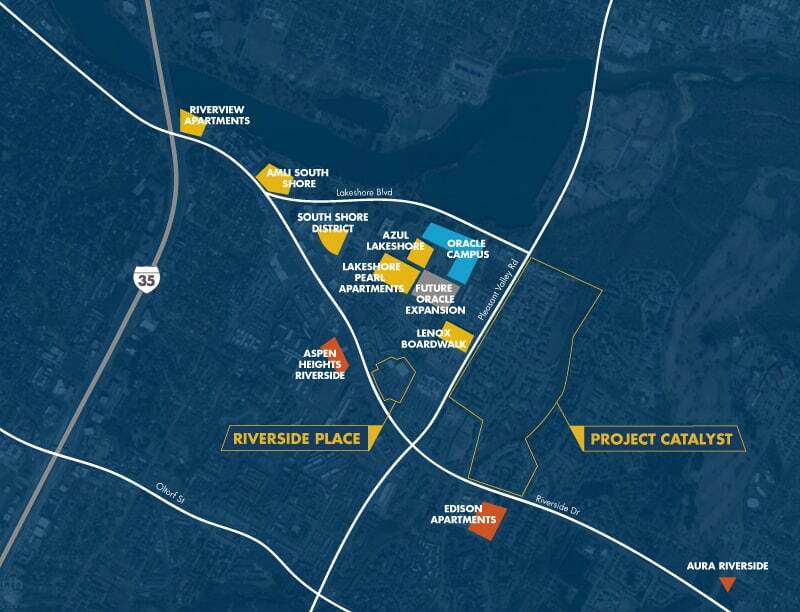 The East Riverside Corridor is turning into the next optimal location for large-scale redevelopments. It has access to a rich pool of local talent, a desirable, central location and the support from the City that provide the necessary prerequisites for a prominent mixed-use development. Be sure to keep East Riverside on your radar, and be prepared for future growth in the area as more and more users recognize the potential that the market holds. 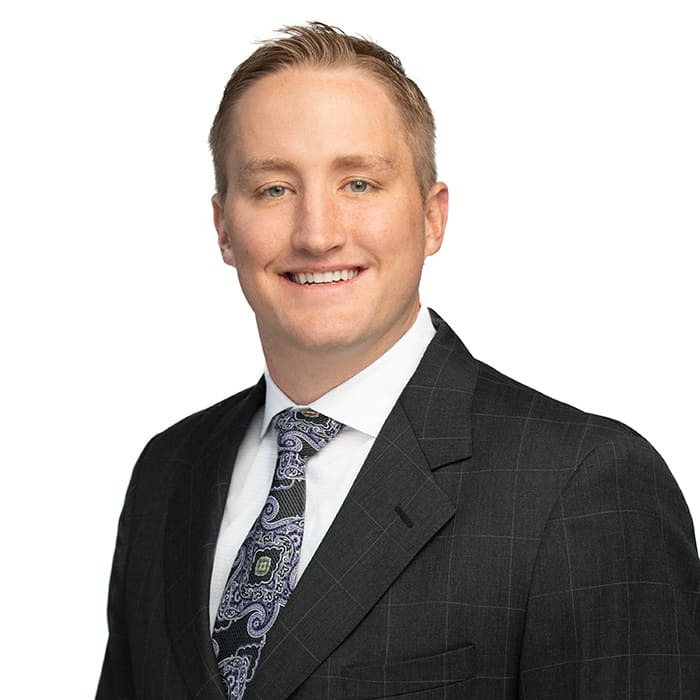 If you have any question about East Riverside or want to get involved in the action, please give us a call or schedule a consultation with our Austin market experts today. Andrew is the boisterous number-cruncher behind the AQUILA Investment Team. 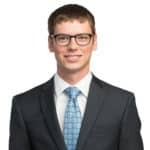 He’s our excel guru – modeling the financials, running the analysis and checking the facts to ensure that your investment is sound and that you’re getting the best return for your dollar.